Identify several special chemical equilibria and construct their Ka expressions. In one sense, all chemical equilibria are treated the same. However, there are several classes of reactions that are noteworthy because of either the identities of the reactants and products or the form of the Keq expression. HC2H3O2 is soluble in H2O (in fact, it is the acid in vinegar), so the reactant concentration will appear in the equilibrium constant expression. But not all the molecules separate into ions. This is the case for all weak acids and bases. An acid dissociation constant, Ka, is the equilibrium constant for the dissociation of a weak acid into ions. Note the a subscript on the K; it implies that the substance is acting as an acid. The larger Ka is, the stronger the acid is. Table 13.1 “Acid Dissociation Constants for Some Weak Acids” lists several acid dissociation constants. Keep in mind that they are just equilibrium constants. Thus for so-called polyprotic acids, each H+ ion comes off in sequence, and each H+ ion that ionizes does so with its own characteristic Ka. Write the equilibrium equation and the Ka expression for HSO4− acting as a weak acid. Write the equilibrium equation and the Ka expression for HPO42− acting as a weak acid. The Ka is used in equilibrium constant problems just like other equilibrium constants are. However, in some cases, we can simplify the mathematics if the numerical value of the Ka is small, much smaller than the concentration of the acid itself. Example 11 illustrates this. What is the pH of a 1.00 M solution of HC2H3O2? The Ka of HC2H3O2 is 1.8 × 10−5. What is the pH of a 0.500 M solution of HCN? The Ka of HCN is 6.2 × 10−10. Thus it is simple to calculate the Kb of a base from the Ka of its conjugate acid. What is the value of Kb for C2H3O2−, which can accept a proton and act as a base? What is the value of Kb for PO43−, which can accept a proton and act as a base? The Ka for HPO42− is 2.2 × 10−13. In Chapter 4 “Chemical Reactions and Equations”, Section 4.2 “Types of Chemical Reactions: Single- and Double-Displacement Reactions”, on chemical reactions, the concept of soluble and insoluble compounds was introduced. Solubility rules were presented that allow a person to predict whether certain simple ionic compounds will or will not dissolve. Table 13.2 “Solubility Product Constants for Slightly Soluble Ionic Compounds” lists some values of the Ksp for slightly soluble ionic compounds. Write the Ksp expression for Ca3(PO4)2. Write the Ksp expression Ag2SO4. Equilibrium problems involving the Ksp can also be done, and they are usually more straightforward than other equilibrium problems because there is no denominator in the Ksp expression. Care must be taken, however, in completing the ICE chart and evaluating exponential expressions. What are [Ag+] and [Cl−] in a saturated solution of AgCl? The Ksp of AgCl is 1.8 × 10−10. Thus [Ag+] and [Cl−] are both 1.3 × 10−5 M.
What are [Ba2+] and [SO42−] in a saturated solution of BaSO4? The Ksp of BaSO4 is 1.1 × 10−10. What are [Ca2+] and [PO43−] in a saturated solution of Ca3(PO4)2? The Ksp of Ca3(PO4)2 is 2.1 × 10−33. This is similar to Example 14, but the ICE chart is much different because of the number of ions formed. What are [Mg2+] and [OH−] in a saturated solution of Mg(OH)2? The Ksp of Mg(OH)2 is 5.6 × 10−12. People who drink wine from bottles (as opposed to boxes) will occasionally notice some insoluble materials in the wine, either crusting the bottle, stuck to the cork, or suspended in the liquid wine itself. The accompanying figure shows a cork encrusted with colored crystals. What are these crystals? 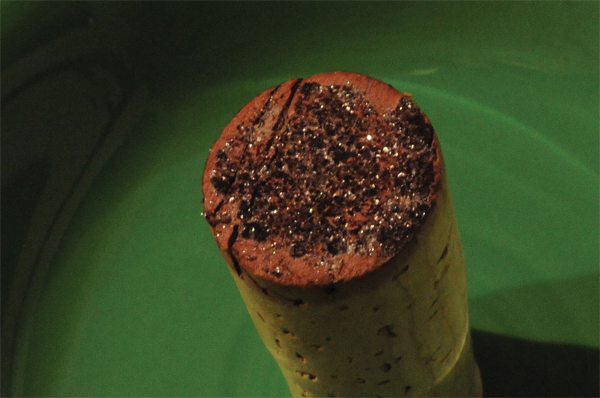 The red crystals on the top of the wine cork are from insoluble compounds that are not soluble in the wine. Source: Photo courtesy of Paul A. Hernandez, http://www.flickr.com/photos/paul_a_hernandez/2940862302/. One of the acids in wine is tartaric acid (H2C4H4O6). Like the other acids in wine (citric and malic acids, among others), tartaric acid imparts a slight tartness to the wine. Tartaric acid is rather soluble in H2O, dissolving over 130 g of the acid in only 100 g of H2O. However, the potassium salt of singly ionized tartaric acid, potassium hydrogen tartrate (KHC4H4O6; also known as potassium bitartrate and better known in the kitchen as cream of tartar), has a solubility of only 6 g per 100 g of H2O. Thus, over time, wine stored at cool temperatures will slowly precipitate potassium hydrogen tartrate. The crystals precipitate in the wine or grow on the insides of the wine bottle and, if the bottle is stored on its side, on the bottom of the cork. The color of the crystals comes from pigments in the wine; pure potassium hydrogen tartrate is clear in its crystalline form, but in powder form it is white. The crystals are harmless to ingest; indeed, cream of tartar is used as an ingredient in cooking. However, most wine drinkers don’t like to chew their wine, so if tartrate crystals are present in a wine, the wine is usually filtered or decanted to remove the crystals. Tartrate crystals are almost exclusively in red wines; white and rose wines do not have as much tartaric acid in them. Equilibrium constants exist for certain groups of equilibria, such as weak acids, weak bases, the autoionization of water, and slightly soluble salts. Explain the difference between the Keq and the Ksp. Explain the difference between the Ka and the Kb. Write the balanced chemical equation that represents the equilibrium between HF(aq) as reactants and H+(aq) and F−(aq) as products. Write the balanced chemical equation that represents the equilibrium between CaF2(s) as reactants and Ca2+(aq) and F−(aq) as products. Assuming that all species are dissolved in solution, write the Keq expression for the chemical equation in Exercise 3. Noting the phase labels, write the Ksp expression for the chemical equation in Exercise 4. Determine the concentrations of all species in the ionization of 0.100 M HClO2 in H2O. The Ka for HClO2 is 1.1 × 10−2. Determine the concentrations of all species in the ionization of 0.0800 M HCN in H2O. The Ka for HCN is 6.2 × 10−10. Determine the pH of a 1.00 M solution of HNO2. The Ka for HNO2 is 5.6 × 10−4. Determine the pH of a 3.35 M solution of HC2H3O2. The Ka for HC2H3O2 is 1.8 × 10−5. Write the chemical equations and Ka expressions for the stepwise dissociation of H3PO4. Write the chemical equations and Ka expressions for the stepwise dissociation of H3C6H5O7. If the Ka for HNO2 is 5.6 × 10−4, what is the Kb for NO2−(aq)? If the Ka for HCN is 6.2 × 10−10, what is the Kb for CN−(aq)? What is [OH−] in a solution whose [H+] is 3.23 × 10−6 M? What is [OH−] in a solution whose [H+] is 9.44 × 10−11 M? What is [H+] in a solution whose [OH−] is 2.09 × 10−2 M? What is [H+] in a solution whose [OH−] is 4.07 × 10−7 M? Write the balanced chemical equation and the Ksp expression for the slight solubility of Mg(OH)2(s). Write the balanced chemical equation and the Ksp expression for the slight solubility of Fe2(SO4)3(s). What are [Sr2+] and [SO42−] in a saturated solution of SrSO4(s)? The Ksp of SrSO4(s) is 3.8 × 10−4. What are [Ba2+] and [F−] in a saturated solution of BaF2(s)? The Ksp of BaF2(s) is 1.8 × 10−7. What are [Ca2+] and [OH−] in a saturated solution of Ca(OH)2(s)? The Ksp of Ca(OH)2(s) is 5.0 × 10−6. What are [Pb2+] and [I−] in a saturated solution of PbI2? The Ksp for PbI2 is 9.8 × 10−9. The Ksp is a special type of the Keq and applies to compounds that are only slightly soluble. Mg(OH)2(s) ⇄ Mg2+(aq) + 2 OH–(aq); Ksp = [Mg2+][OH−]221. Some Special Types of Equilibria by Jessie A. Key is licensed under a Creative Commons Attribution-NonCommercial-ShareAlike 4.0 International License, except where otherwise noted.